Here’s an easy reference summary of our first dance styles series for you to click on and review. Day 1: We can either start with your song advising of a style which would suit, or even help you find your song if you know what style of dance you’d love to learn. 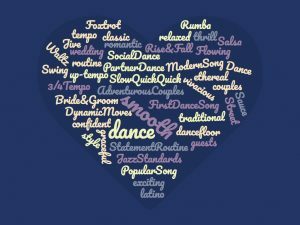 Read this post to see how you can start your First Wedding Dance Journey. Day 2: Foxtrot – classic, romantic and smooth. Day 3: Waltz – ethereal, smooth and stylish. Day 4: Salsa and Rumba – dynamic, sensual and cool. Day 5: Jive and Swing – light, bouncy and fun. 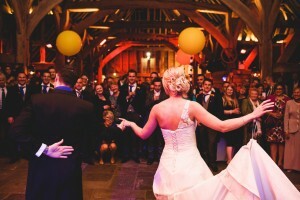 Day 6: Freestyle Dance – adventurous and non-traditional; bringing the wow to your wedding! If you’d like to have an initial conversation about your dance, or book a dance consultation with one of our experienced teachers. Swing dance styles are the more fun, vivacious dance styles to suit more up-tempo tracks – great first wedding dances to to get the party started. There are many types of Swing Dance, including Lindy Hop, Charleston, Jive and Rock N Roll created in the 1920s-50s to accompany swing style jazz music. Heres a throwback photo to one of our jive parties we taught at for a regular social dinner and dance! Social Jive Dance basic steps consist of two slow steps on the spot and then a ‘quick quick’ rock back and forward. These styles don’t travel around a dance floor, although the size and energy of movements that can go towards the spins and sometimes jumps and lifts (for those feeling really adventurous!) can really eat up the space. The steps should be light and bouncy and the upper body is free and responds to the usually jazzy and lively music with an air of showmanship and lots of smiles! We’re not just about weddings. TLOD has also taught Jive and Swing dance parties for many occasions such as birthdays and commercial party events. 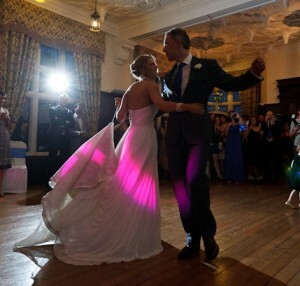 Taster sessions in any dance style are a fun way to help guests get up to their feet and onto the dance floor. Your guests get mingling whilst learning some basic steps too – well we don’t want them feeling left out of the dancing action! If you want to bring a bit of sauce to your first dance or maybe your first dance song has a bit of latino flavour, Salsa is a good style to throw some dynamic moves into your routine. Originally from Cuba with African and Spanish influences, and developed further in South America and New York too, this dance style is sure to bring a bit of fiesta to your day. A style of dance that can also transfer to many dance floors together, once you have some basics under your belts. Salsa can be entirely spiced up with the full on latino hip swank, it can be fun and energetic, sensual, or tamed down according to your preference to become a stylish first dance. There are many different types of Salsa, depending on the country or region of origin – e.g. Cuban or New York cross body style. Your teacher may specialise in one, two or many styles thus influencing the footwork and floor patterns you will learn. Have a listen to the Buena Vista Social Club album. Quite often you may find Salsa covers of popular songs – worth a search through YouTube for the options! Just like Salsa, Rumba has flexibility to be as camped up Strictly Come Dancing/competition style or smoothed out to be a little more relaxed. A little more intimate style than salsa, Rumba suits many modern popular and jazz standard songs on the 4/4 tempo, with a prolonged, slow first step and two percussive quick steps. The song doesn’t necessarily have to have latino flavour. Here’s Amie and Alex’s First Dance using the Rumba footwork. Watch out for the sustained first two beats to the bar. Over the coming week we’re releasing a First Wedding Dance style per day as part of our guide to helping to choose a style for you. Today we’re looking at Foxtrot! Foxtrot is quite a common wedding dance style – a classic, romantic and smooth ballroom dance, couples can take their time and feel confident on the dance floor. Some types of Foxtrot can be a little more up-tempo depending on the song. Think ladies gliding around in their beautiful ball gowns, led by dapper gents in their coats and tails. Classy. You know you want to learn a routine or have dance lessons for your First Wedding Dance, and may even have played out how the first dance might look in your heads. The many viral wedding dance videos may have been inspiration for your daydreams – but which style of dance should you choose? Over the coming week we’ll release a dance style per day as part of our guide to helping you decide. You probably know which song you’d like to dance to on your special day. Without dance lessons or prior preparation, the gentle sway from side to side may be some couples’ natural go-to groove for the more traditional slow song, or for something more up tempo, a fun ‘we’re in the disco style’ bop might do. For something a little more memorable however, to either give yourselves a bit of a confidence boost on the day, or to give your guests something to talk about, a little choreography (let’s call it a structured routine if that sounds scary), or dance lessons in a style that suits your song could be for you. Your The Love Of Dance teacher is more likely to teach you the ‘social’ style of dance forms rather than the formal, more structured competition style. You may see variations in footwork in comparison to styles of dance you see on tv as there are quite often different variations of each type, so don’t worry if your style doesn’t look exactly like you’ve seen on TV dance competitions etc. We aim however to leave you with a good foundation in your style for you to carry with you forever more! The Love of Dance teachers will work with you and your choice of song/s to find a style of dance that works with the music. I say either ‘song’ or ‘songs’, as you may either be stuck on which song of many to choose from, in which case a consultation with us will demonstrate and allow you to try a few dance styles to suss out what you feel comfortable with, or you may want a medley of songs, so your teacher may suggest you have a little mash-up of dance styles to create a really impressive routine! Your teacher will also get to know you and help to create the bespoke routine unique to your personalities, abilities and initial visions you may have. …but we don’t have a Song? You may even have the style of dance in mind, but not a clue of a suitable song to go with your style. We can advise here too, giving you some songs to listen to if need be. There are many websites giving First Dance Song inspiration – just have a google search and see what comes up. You may have a live wedding band and you could talk to them about performing the first dance song for you. Make sure you give them the same version of the song you’ve got in mind so they play the right arrangement as you are unlikely to get a rehearsal with them. The Love of Dance can also provide live music to suit a desired theme or musical taste, taking the hassle out of finding music yourselves. Visit our Event Entertainment Page for more info and contact us to discuss. It’s founder Alison’s birthday on Saturday 19th August. 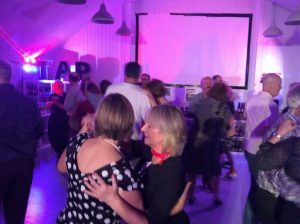 To celebrate TLOD is offering a 20% discount to anyone who books their First Dance Lessons, Hen Party or Event Entertainment before 30th September 2017 and mentions “TLOD Birthday”. We’ll announce the winner on Alison’s birthday! This competition is running on Facebook, Twitter and Instagram – so you may increase your chances of winning if you share through as many routes as possible!